A lot has been said on the resurgence and rebound of Zupco buses on our roads yet none are showing. Not long ago the print media was awash with news that two hundred buses had arrived in the country and that a similar number were on the way, does that ring a bell? The news on new buses had kombi operators quacking in their shoes thinking they would lose business to the new boys in town, now they are having the loudest last laugh. What is happening at Zupco? The quietness and non-visibility is alarming, are they still in operation? 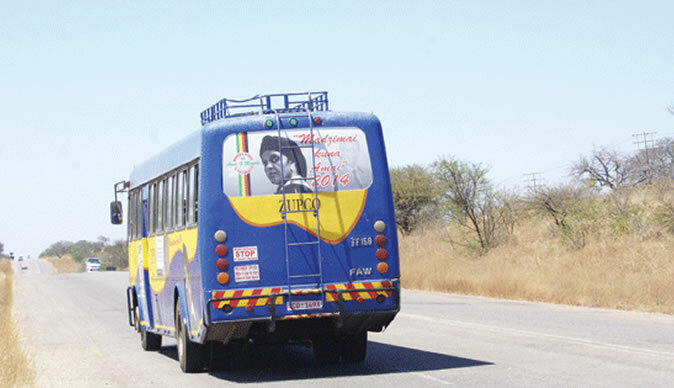 The bus company used to be one of the largest employers in the country, providing an efficient and affordable service in both urban and rural areas. The bus crews were smart and ready to help, not some of todays's kombi crews who behave as if hewn from the same block. May the New Era brooms visit Zupco with the sole purpose to revive the bus company. If necessary, remove 'dead wood' and inject new blood into the company. Whilst they are indeed providing a service, some kombis are more dangerous than walking. The 'whindis' are foul mouthed, respect noone and behave as if raised at places where windows were used more often than doors.